RENSSELAER, N.Y. — NYISO said Monday it would revise its carbon pricing proposal to enhance the bidding treatment for carbon-free resources and help prevent carbon leakage within its market. Stakeholders requested the change, which will allow carbon-free resources bidding opportunity cost to use an estimated carbon bid adjustment to better reflect the impact of carbon pricing when those resources set the locational-based marginal price (LBMPc). Ethan D. Avallone, NYISO senior energy market design specialist, told the Integrating Public Policy Task Force (IPPTF) the ISO previously proposed using a carbon bid adjustment of zero dollars for opportunity cost resources when calculating the LBMPc. As a result of stakeholder feedback, however, the grid operator will now use a non-zero bid adjustment when carbon-free opportunity cost resources represent the marginal resource setting the price during an interval. Opportunity cost resources represent those carbon-free resources able to store energy and structure their bids to achieve delivery schedules during the most economic periods of the day, Avallone said. In periods of the day with lower prices, the bids of such resources therefore reflect the estimated opportunity cost of profit from periods of the day with higher prices. NYISO determined that setting the LBMPc at zero dollars when a carbon-free resource bidding opportunity cost was on the margin would cause leakage of emissions because external resources not bidding that cost could be selected instead for dispatch based on price, regardless of their emissions profile, Avallone said. This could lead to increased imports during periods when interal opportunity cost resources are on the margin. 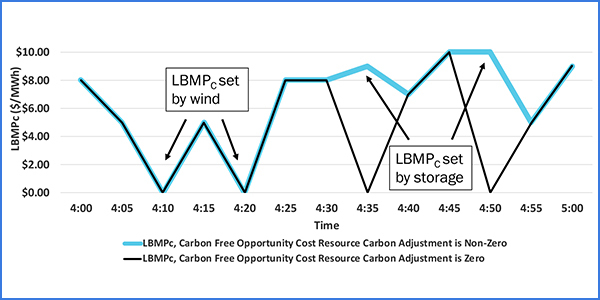 The LBMP is expected to increase slightly under carbon pricing to reflect the emissions of the marginal unit, and carbon-free opportunity cost resource bids are likely to increase as a result of carbon pricing in some hours. “This is essentially one update, dealing with carbon pricing and the calculation of LBMPc with opportunity cost resources … and will lead to export/import transaction flows that more appropriately reflect what flows would have been absent carbon pricing,” Avallone said. Michael DeSocio, the ISO’s senior manager for market design, said there is an unrelated effort at the ISO related to energy storage resources that deals with opportunity cost reference levels, which will require a few steps before implementation. More specific details on how the ISO will model opportunity cost depend on completing the market design, he said. The opportunity cost resource’s bid is already based on its opportunity cost projection and will change with carbon pricing because that will change its opportunity cost, he said. External resources would receive the full increase in the ISO’s LBMP due to carbon pricing during hours when a carbon-free resource bidding opportunity cost is on the margin, and those increased revenues would occur regardless of the resource type backing the transaction, whether carbon-emitting or not. Howard Fromer, director of market policy for PSEG Power New York, suggested it might be more fair to external resources for the ISO to provide them with an estimate of the LBMP rather than making them guess. DeSocio explained why the ISO thought it makes more sense for those trading on the border to assume the associated risks. “Certainly the ISO can estimate what it thinks this LBMPc is, and you the trader can decide whether you like that number or not and then adjust the rest of your offer to accommodate it,” DeSocio said. The original assumption of what a trader thought the implied heat rate was going to be inside New York now has to be set against whether they trust the ISO’s prediction, plus the ISO has to assume the LBMP values because it doesn’t know the exact value until the dispatch is over, he said. The task force next meets on Dec. 3.